After two solid days of bed rest I'm think I can see the light at the end of the tunnel. Tonsillitis really knocks me around, I seem to get it an awful lot, at least once every year I think. My tonsils are still huge and white and I've not eaten for two days, but I did just manage a cup of green tea and feel much better for it. Mind you, not well enough to stay up and paint my nails, but luckily I still have two manis up my sleeve. Today's prompt is inspired by a song. I find this last part of the challenge the hardest. I had no idea what to for this mani, no songs were jumping out at me for a theme. I actually sat at my nail painting table for half an hour trying to think of something, then an ad came on TV for part two of a mini series shown here in Australia - Peter Allen - Not the boy next door. Once of the song featured in the ad, and ultimately in the show is my favourite Peter Allen song - I still call Australia home. I still call Australia home"
To depict this I have, The Statue of Liberty (New York), Christ the Redeemer statue (Rio), Big Ben (London). 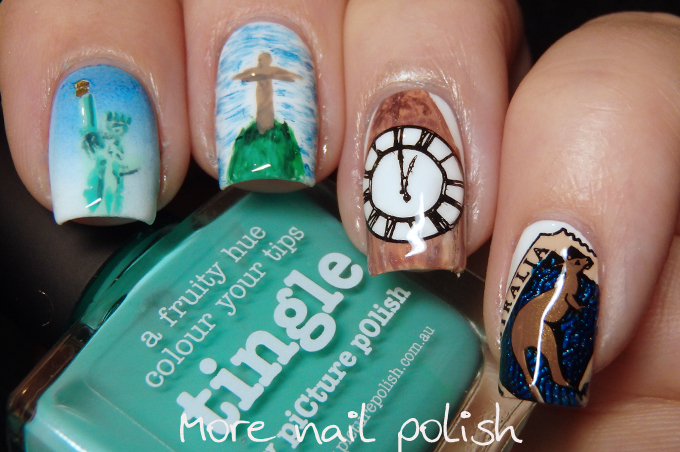 On my pinky and thumbs I have images depicting Australia. 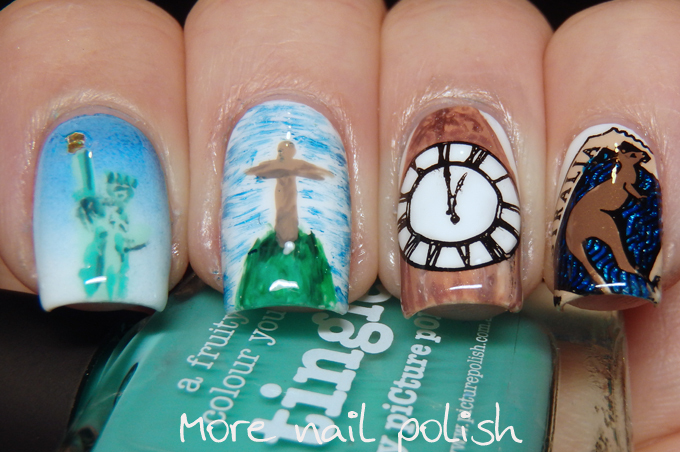 My inspired by a song nails from 2013 and 2014! Aw, I hope you feel better soon! I love the manicure, it's so cute. :) I'll most likely skip today, as I really can't think of a song worth to paint on my nails lol. The same goes for the rest of the "inspired by..." prompts. I'd much rather do another galaxy. 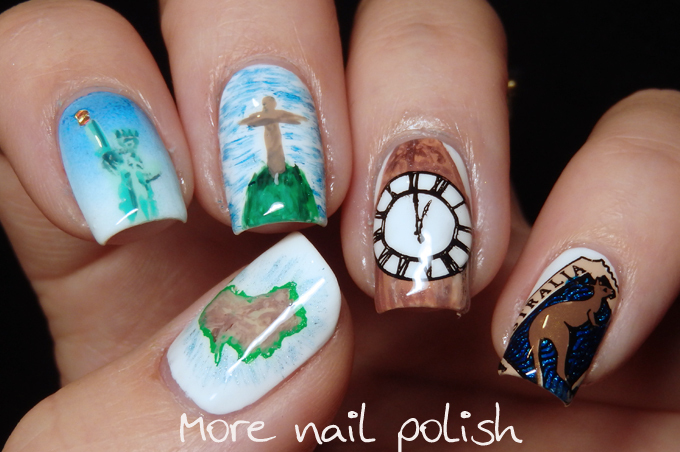 I don't know the song, but your nails are amazing! I adore this! 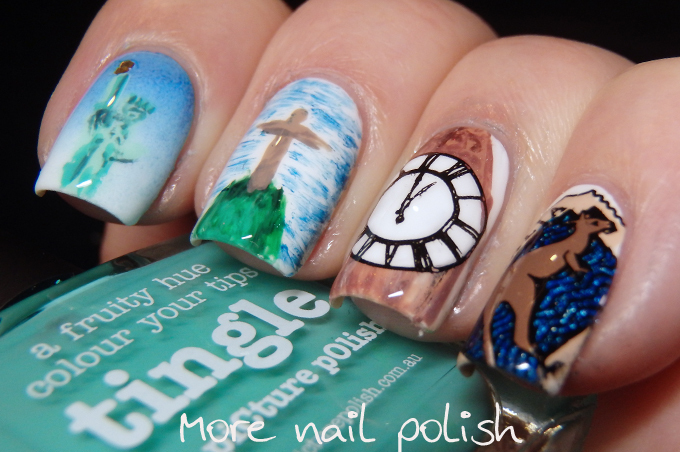 Such a fun song and great nails! I don't know the song but I love the Liberty statue! So amazingly unique yet so beautiful. 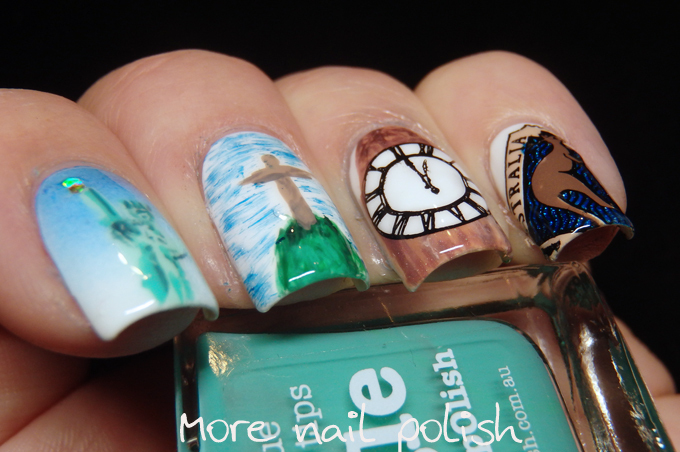 I love everything about this mani. You perfectly nailed it! 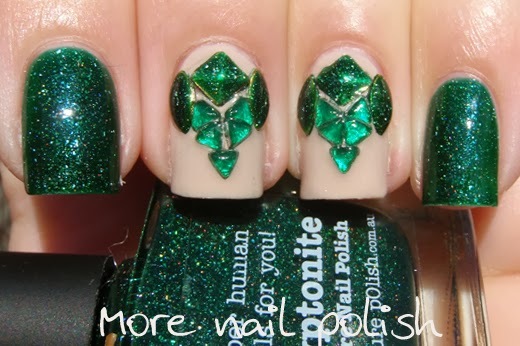 I have very similar manicure at the nail art salon ( http://nail-it-europe.com/blog/nail-art/signature-nail-art/ ). I liked it so much!! !